Adorable and functional. Some markers are "smeary" on the board at times. Wipes cleanly with little residue. Very sturdy and the color is beautiful! Keep you and your whole family organized with this magnetic monthly wall calendar. 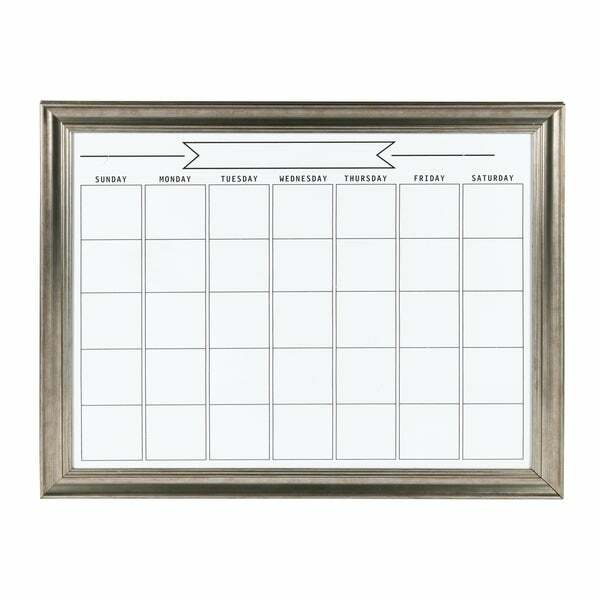 This wall organizer is a white magnetic dry erase monthly calendar to post all your important appointments or display your photos. This framed magnetic board includes four round black magnets to post fliers and important memos and a dry erase marker to keep note of all your important dates. This bulletin board has d-ring hangers attached to the back for easy wall display! The outer dimensions are 29 inches wide by 23 inches high by 1 inch deep. The decorative scooped frame border is 1.75 inches wide and 1 inch deep. The white board surface is 19.5 inches high by 25.5 inches wide. Each day of the month has a 3.25 square box. This wall calendar is perfect for use in an entryway, home office, or kitchen to organize and display everything you need in style. Decorative framed wall magnetic dry erase monthly calendar for home or office organization. Magnetic dry erase surface is 19.5 inches by 25.5 inches; Each day square is 3.25 inches. Wall mounted display dimensions are 23 inches high by 29 inches wide by 1 inch deep. D-Ring hangers are already attached to frame; Includes dry erase marker and 4 round magnets. Combine with coordinating pieces in the Macon collection for a complete wall organizer solution. Dimensions 1.0 In. X 29.0 In. X 23.0 In. This is exactly what Iwas looking for. It erases easily, has a good quality frame and doesnt look cheap, especially for the price! The magnetic marker that comes with it works well, too. Great quality board and fits our gray decor perfectly. Comes with a black fine tip maker and 4 magnets. The daily squares provide lots of space for adding in activities. Definitely would recommend for a family needing to organize. Beautiful magnetic calendar. It is large enough without being too large. The blocks provide enough space to list events and the magnetic surface allows me to attach paper reminders to specific dates. I plan to purchase another one. This hangs in my kitchen and it looks great! It cleans off easy. We keep up with all the coming and goings of the kids and meals! Such great quality. We are very please. I'm giving this 4 stars only because it says it's white and it is more of a cream or even beige color. It looks like it is well made but I am going to have to paint the border to more of a white shade.